Each student receives a 50% discount off of most books in the HSG Book Store. During class, please ask the instructor about purchase details. 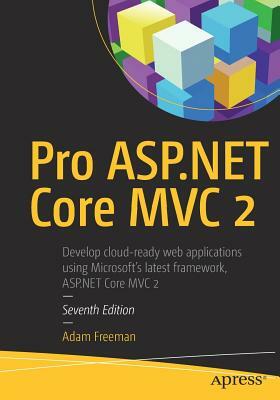 Now in its 7th edition, the best selling book on MVC is updated for ASP.NET Core MVC 2. It contains detailed explanations of the Core MVC functionality which enables developers to produce leaner, cloud optimized and mobile-ready applications for the .NET platform. This book puts ASP.NET Core MVC into context and dives deep into the tools and techniques required to build modern, cloud optimized extensible web applications. All the new MVC features are described in detail and the author explains how best to apply them to both new and existing projects. The ASP.NET Core MVC Framework is the latest evolution of Microsoft's ASP.NET web platform, built on a completely new foundation. It represents a fundamental change to how Microsoft constructs and deploys web frameworks and is free of the legacy of earlier technologies such as Web Forms. ASP.NET Core MVC provides a "host agnostic" framework and a high-productivity programming model that promotes cleaner code architecture, test-driven development, and powerful extensibility. Best-selling author Adam Freeman has thoroughly revised this market-leading book and explains how to get the most from ASP.NET Core MVC. He starts with the nuts-and-bolts and shows you everything through to advanced features, going in-depth to give you the knowledge you need. The book includes a fully worked case study of a functioning web application that readers can use as a template for their own projects. This book is for web developers with a basic knowledge of ASP.NET and C# who want to incorporate the latest improvements and functionality in the ASP.NET Core MVC 2 Framework.